Art Show at Furthur Frames in Denver, August 1st. I am pleased to announce that on August 1st, at Furthur Frames in Denver, there will be a show of my artwork, all beautifully framed. Furthur Frames has emerged in the past few years as one of the go-to framers for my work, and this exhibit will showcase many uniquely framed variant prints. There will also be a focus on my Garica/Grateful Dead prints, to coincide with the Jerry Garcia Symphonic Celebration at Red Rocks that Sunday. I hope a lot of you Colorado people can make it out to say hi, and maybe a few of you would even want to travel in for the weekend. I will be at the opening, meeting, greeting and doodling. Oh boy. I never miss the Gathering of the Vibes as it is a hometown show and I see alot of people I grew up with. But I may have to miss it this year because Mr. Marq Spusta is having an exhibition in mile high. Can’t wait to see you Marq and hopefully the family when you come to Denver!! This will be a great start to the weekend!! Ill be traveling from Illinois to CO for the week for a wedding and some bluegrass and gonna hit this up for sure. Cant pass up the chance to meet the man him self….and maybe get a doodle!! GREAT NEWS,,,Looking forward to seeing you. 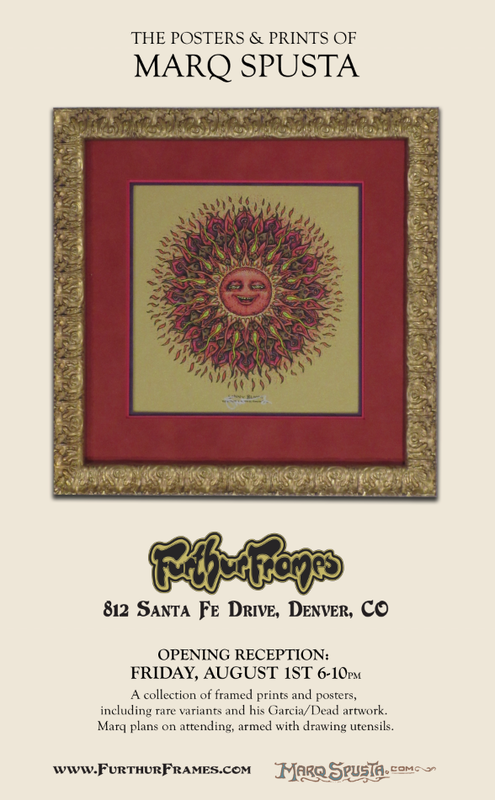 For poster collectors, if you have never seen Furthur Frames creations…you are in for a treat. Marq’s art is over the top and the framing is icing on the cake. Any idea of what will be for sale at this event. The framed prints/variants, full sized prints, minis…??? Thanks! Lots of framed posters and prints, variants, mini prints, a couple OGs. Maybe 40-60 things on the wall, and hopefully a unframed edition or two for sale. that Moe Down is sharp, I love the pig.